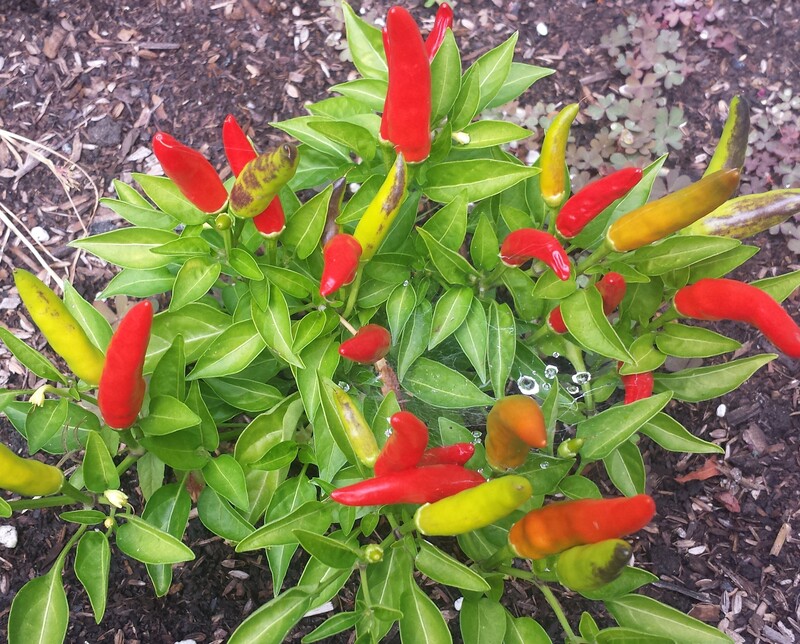 Is your garden so loaded with hot peppers that you don’t know what to do? I mean a little bit goes a long way… Last fall we had an early frost warning and I still had lots of peppers that I hadn’t picked yet, since I usually pick them as I use them. How many hot peppers can you use at a time? So I ran outside and harvested everything that was left before they froze on the vine. There were lots of Cayenne, plus a smattering of Fresno, Garden Salsa, Ancho Chili, Sandia, New Mexican Red and Numex peppers, all in the medium to hot category. I had planted ghost peppers and grew beautiful plants that didn’t yield any fruit so I never got to see if they stood up to their reputation as hottest pepper in the world. 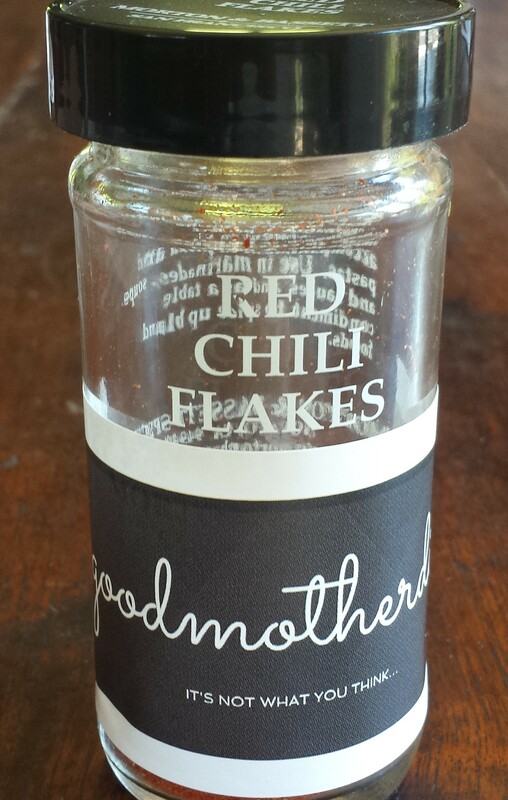 Earlier in the season I had already made Hot Pepper Jelly (Sorry, before I started this blog, but will do again) so I decided to try my hand at making hot pepper flakes. My Dad used to comb farmer’s markets, and my Mom’s garden, I suspect, for certain varieties of hot peppers and he would dry them and make his own pepper flakes. For Father’s Day one year I made him labels, “Al’s Own”. It was always fun to get a coveted jar from Dad and I loved using them in cooking. 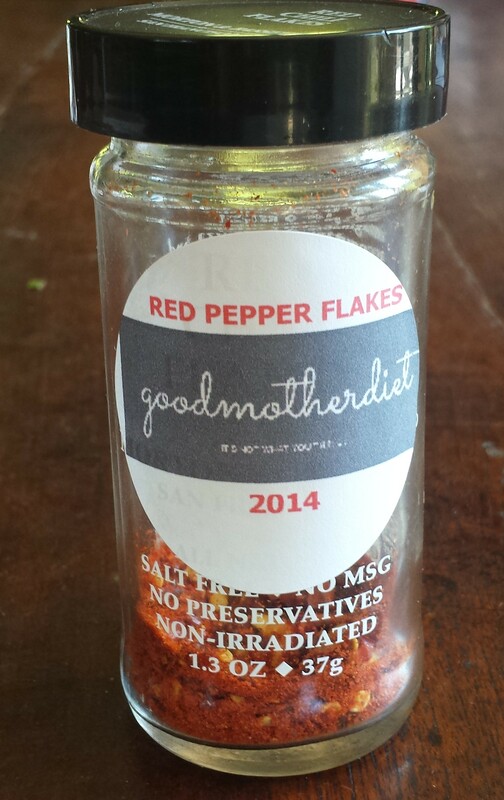 As I would sprinkle out those little red flakes, I always thought about him (clever gift). Now I realize how many peppers he must have used, since my whole string of peppers (about 14 inches long) only made half a spice jar worth, although many of mine were cayenne which are very small.. However, one whiff from this small jar will clear your head straight back into your brain. It makes you realize how old the spices we buy in the supermarket must be. 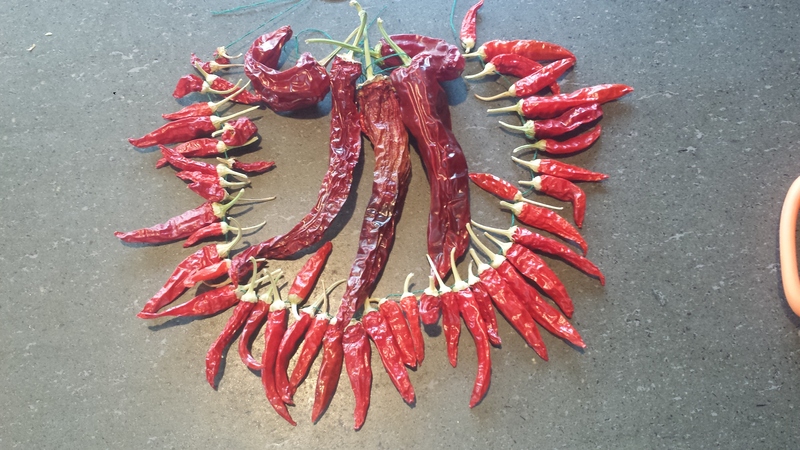 Drying peppers is easy and a great use of excess peppers that would otherwise spoil. 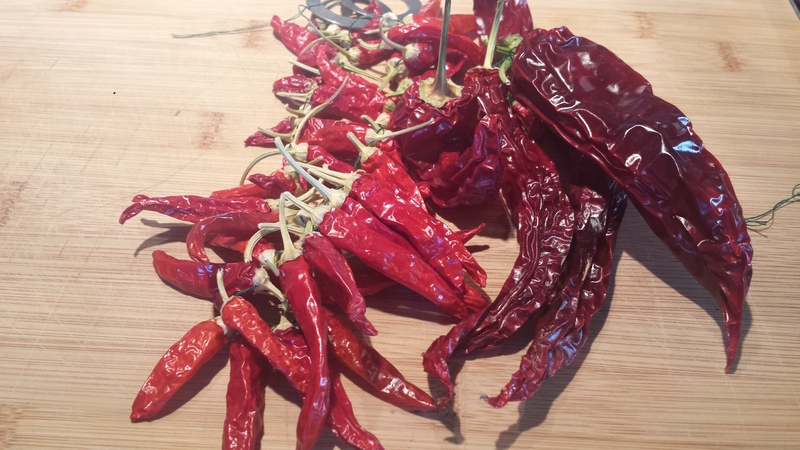 Drying them intensifies their heat and flavor, making them way hotter than they are in their fresh state. 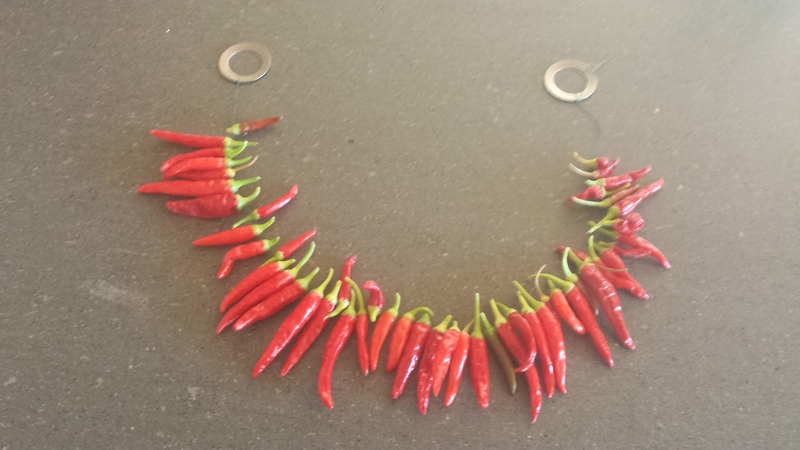 Peppers can be dried in the oven on low heat (200 degrees for several hours), in a dehydrator or out in the open air, which takes one or two weeks. I opted for the open air method which is also the easiest. 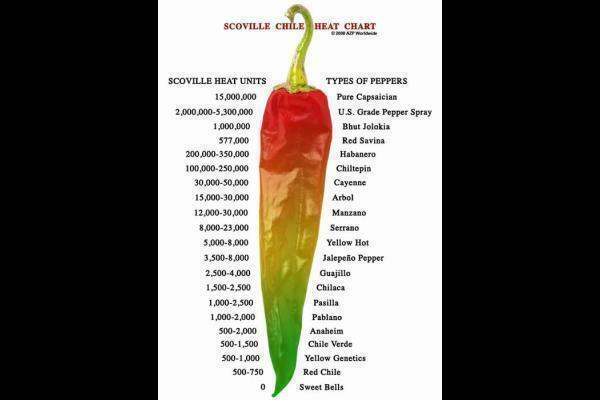 For more information on how to bake or dehydrate peppers, check out Food.com. TIP: Rather this should say WARNING! Use gloves when handling hot peppers as the oil in their skins is extremely hot and difficult to wash off. It can be transferred to your skin or eyes if you touch your face. 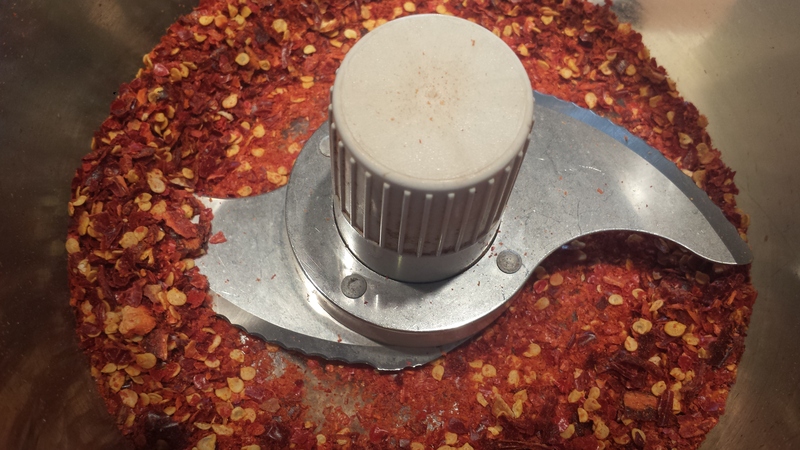 In addition, when grinding the dried peppers into flakes, hot fumes will emanate from the food processor so take precautions. Pick the peppers, leaving the stems intact. Wash and dry them to remove any dust and discard any that are soft and mushy or have spoiled areas. Using a sewing needle with thread, doubled and knotted at the end, run the needle through the thickest part of the stem and repeat with the remaining peppers to make a chain of peppers. I found these metal rings to use as stoppers so the peppers don’t slide off the ends. They also doubled as hangars. You can also use buttons or anything else you find to secure the ends, even a stick. Hang string of peppers in a warm and dry place out of the way in an area where they will get plenty of fresh air and sunlight, if possible. It can take up to two weeks for them to dry fully. They should be uniformly dry and slightly brittle but not brown and crumbling or hard as a rock. 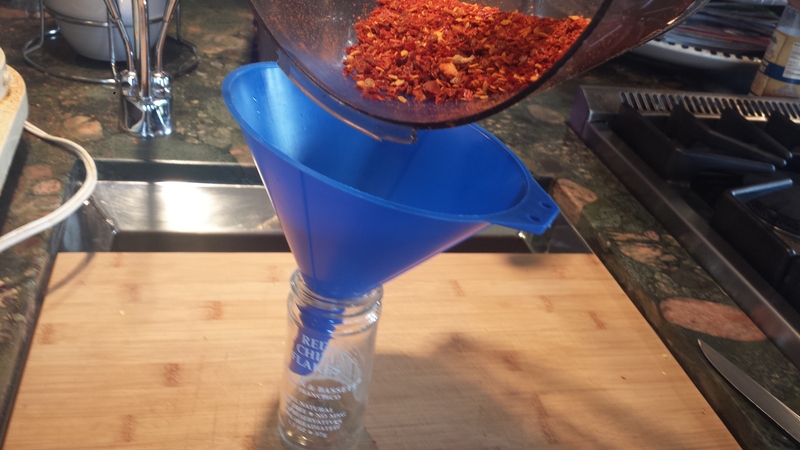 Dried peppers can be stored whole in ziplock bags or plastic container, or they can be ground using a food processor or blender. 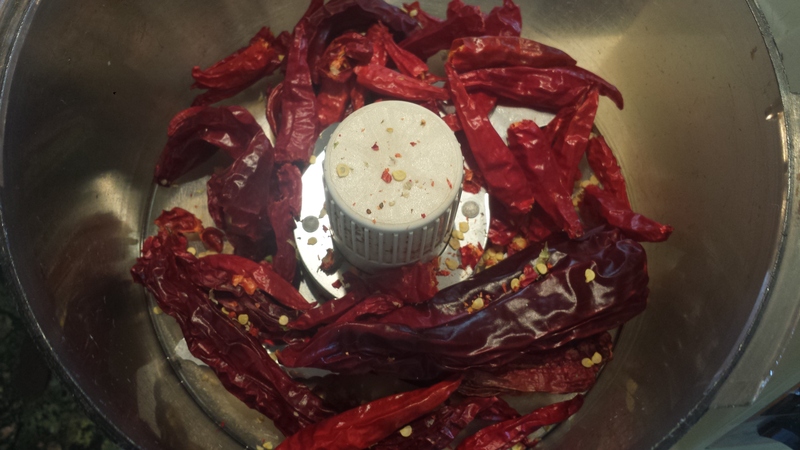 Pulse the dried peppers in a food processor or blender until ground into a powder. Be prepared for hot fumes to come off the peppers. 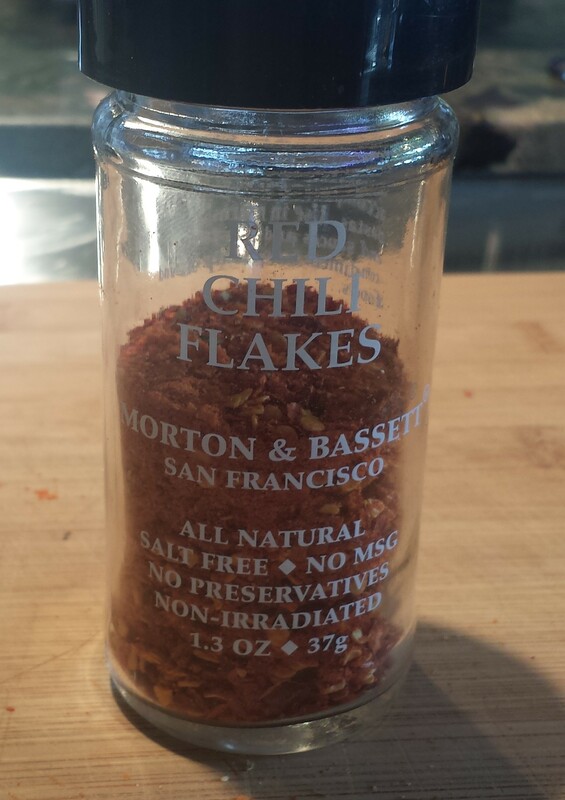 Hot pepper flakes can be stored in glass jars, plastic container or plastic baggies. I reuse old spice jars. All those peppers filled only slightly more than half a regular spice jar, so next time I will increase the quantity or supplement the gleanings from my garden with peppers from the farmer’s market. If you want to give as gifts, adding a label is a nice touch. Or you can make your own custom labels very easily. I ordered blank round labels from http://www.onlinelabels.com and then downloaded a template from their website. The label I used here is #OL5375WX, a 2″ round label that I also use for labeling gift bags or small mouth jars (not a perfect fit but it still looks nice). There is a larger label, #WL-375WG-100 which is a 3.3333″ round label which is the perfect size for labeling a wide mouth jar or a larger bag or bottle. 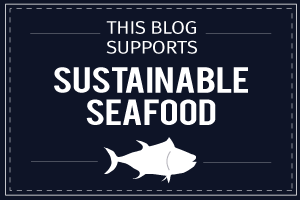 These labels are easy and affordable. Be creative! 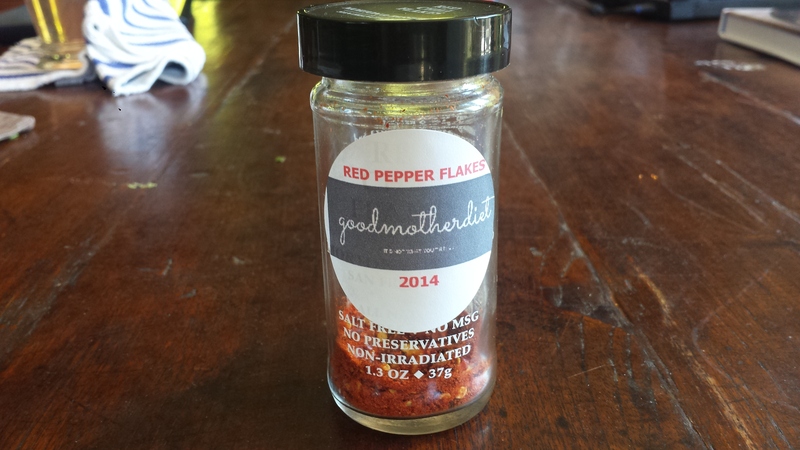 This entry was posted in All Recipes, Canning and Preserving/Gifts and tagged cayenne peppers, drying hot peppers, hot pepper flakes, hot peppers, how to make hot pepper flakes, making a hot pepper string, making hot pepper flakes. Bookmark the permalink.